Clipboard, a web service browser that you install as a bookmarklet, lets you save, share, tag and comment on parts of a website. "I think the best part about Clipboard is that it allows you to save the parts of the Web that you care about, but without the typical compromises that other methods make," Clipboard CEO Gary William Flake tells LAUNCH via email. "More specially, clips in Clipboard look like the original source, retain their functionality (text can be selected, hyperlinks, clicked, and most embeds work, including videos), are created in a very lightweight manner, and are portable in the sense that they can be shared in several different ways." Clipboard, which unveiled its service last week, is still invitation only, but is starting to send out invitations more frequently. You can get early access courtesy of Clipboard and the MIT Review until Oct. 20th. Similar services that let people share and save things include Delicious, Pearltrees, Evernote, Instapaper, Facebook and Twitter. Evernote's Web Clipper extension is most like Clipboard, which lets you click and drag the elements of the site that you want to save. "...I suspect the fidelity and functionality of our clips will stand out," Gary says. "I am also not sure that Evernote has a clear sharing model." Gary founded Clipboard in January 2011 and previously founded Microsoft's Live Labs, Yahoo Research and Overture Research. In April, Clipboard raised $1.39M in funding. Once you have the clipper installed, click the +clipboard to launch the application on the site. To clip part of a website, such as a paragraph, image or block, hover over the content want to save and click it. In the top right corner, there is a box that lets you get out of clipping mode, go to your Clipboard home page or dismiss the Clipper altogether. 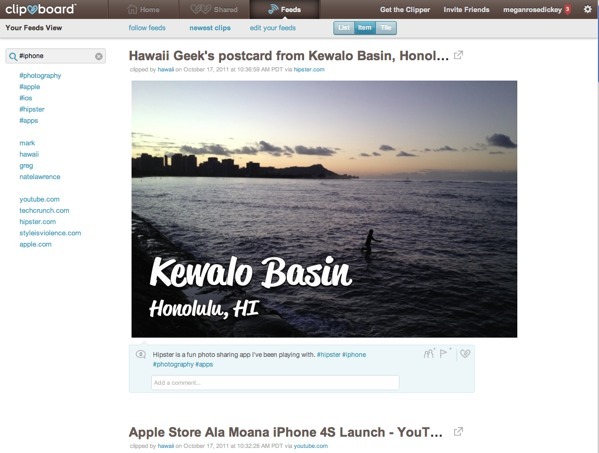 From your homepage, you can add a note, tag or mention other users on Clipboard. You can share the clip on Facebook, Twitter or via email. You can also copy the link or embed the clip on a personal website. The Shared tab lets you see everything Clipboard users are sharing, clips you have shared and clips people have shared with you. In the Feeds tab, you can follow feeds, access newest clips and edit your feed. You can also search for clips to see a feed of all clips related to that topic, such as iOS5.